ThermaPEX® tubing is created using peroxide crosslinking, a so called PEX-a process. By means of heat, a peroxide mixed into the PE raw material is split into radicals. These radicals react with the PE polymer chain and absorb hydrogen atoms to become inert. The polymer chains now become radicals. They, in turn, become inert by joining together - forming crosslinks. ThermaPEX® stands up to higher temperatures than any other forms of PEX. For other crosslinking methods like radiation crosslinking (PEX-c) and Silane crosslinking (PEX-b) the crosslinking takes place at temperatures well below the crystalline melting point. For these methods, when tubing is heated over the melting point, there will be a loss of crystals when the material is cooled down again. The crosslinks will partially disturb the formation of previously existing crystals. So there will be a loss of strength after this reheating - which is not the case for PEX-a tubing. It must be well over the crystalline melting point temperature of around 270°F. The material must also be correctly shaped (must have its tubing form) while the crosslinking takes place inside the polymer melt. After crosslinking has taken place, the material is cooled down and the crystals are formed around the crosslinking points, reinforcing these areas. These principles are valid for all PEX-a processes. ThermaPEX® is stronger and more flexible than other types of PEX tubing. The ThermaPEX® Tubing process starts with a raw material with a density of around 0.940 kg/m3 and the final product has a density of around 0.930 kg/m3!! This is considerably less than other PEX process, and results in a very flexible tubing. How is it possible that a material with this low density still exceeds the ASTM requirements for PEX? The reason is that inventors of this process have succeeded to align most molecular chains AROUND the tubing circumference! Traditional extrusion processes do not provide any orientation of molecules, but their orientation are at random. By having the molecules aligned around the tubing they are ready to absorb the stress caused by inside pressure. So in spite of its lower density, this tubing can actually resist a higher inside pressure than traditional PEX tubing! Burst pressure testing can easily confirm that the pressure resistance is higher for ThermaPEX® Tubing! At the same time, since few molecules are stretched along the tubing, the flexibility is even better than what is explained by the density alone! The homogeneity (consistency) of ThermaPEX® is better than any other product on the market today. Traditional PEX-a processes have raw materials with high density and high molecular weight making the polymer flow characteristics quite poor. The material is mainly pushed through the extruder and raw material particles are just melted together. The flow is very little stirred during the extrusion. Not so in the ThermaPEX-a process. The material is thoroughly worked, the original raw material particles are thoroughly blended, and even stretched out to orient the molecules around the tubing. The result is a excellent homogeneity, antioxidants well disbursed, and better overall properties. Homogeneity can be checked by holding tubing samples towards a bright light. Turn slowly and look through tubing walls. You may notice "cloudiness" in some PEX Tubing. 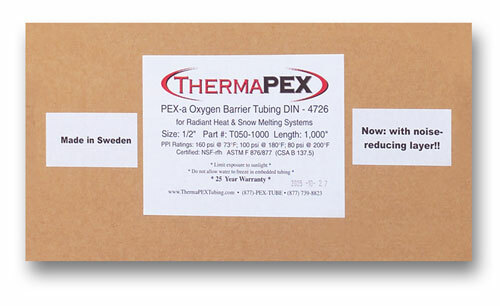 ThermaPEX Tubing is available exclusively at fine distributors throughout the United States.